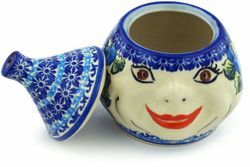 Polish Pottery Garlic Jar. Our face shaped garlic keeper is perfect for decorating your kitchen, but carefully designed to be usable for keeping your garlic fresh and handy. Each jar is carefully hand painted by artisans at KM factory in Boleslawiec, Poland. This gives each jar an individuality and personality not found in most of today's imported mass-produced ceramic goods.